Williston is a “singing school,” as Ben Demerath, our music director always tells us. And surely, our boys and girls singing groups, the Caterwaulers and the Widdigers, produce memorable moments each year. 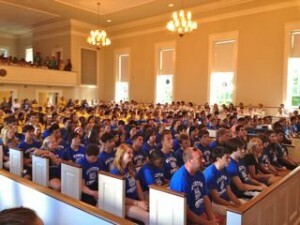 But even Mr. Demerath was surprised by what happened at Sunday’s first Upper School assembly. Gathering in Stephens Chapel following orientation activities, the classes of 2013 through 2016, were arrayed in their class colors. As part of Associate Head of School Jeff Ketcham’s annual talk about the year to come, the words to Journey’s “Don’t Stop Believin'” were displayed on screen and the song was played over the sound system. All of a sudden, the entire assembled student body started spontaneously singing along to the anthem. I have seen more opening days of school than I care to admit to, and the combination of activities that Williston students enjoy in the days leading up to first classes reveals the dedication of all who work here. Not many schools, I suspect, have teachers who are willing to spend two (sleepless?) nights in cabins with ninth graders the weekend before classes; and the time and care with which the deans and dorm parents transition students into Williston regarding community expectations—with an emphasis on integrity—speaks loudly about the relevance of our mission. So here we go with our 172nd school opening, and I look forward to every moment of the good to come.